After a transitional season marred by injury, the Boston University women’s hockey team ended its 2017-18 campaign with a 4-3 overtime loss to the University of Maine in the Hockey East quarterfinals. The season started out slow for the Terriers (14-17-6, 8-11-5 Hockey East), taking five games for them to pick up their first win, which came against the University of Connecticut on Oct. 22. Freshman goaltender Corinne Schroeder began to steal the show, ultimately putting up a .913 goal save percentage and 2.51 goals against average in 25 starts. BU head coach Brian Durocher said he looks forward to seeing Schroeder grow as a player. During the first half of the season, the Terriers posted a 7-9-3 record entering winter break. When the team returned, it was missing its two top-scoring senior forwards Victoria Bach and Rebecca Leslie, who were representing Team Canada at the 2018 Nations Cup. In the absence of the pair, BU picked up three losses and a tie. However, missing its traditional top line gave an opportunity for freshman forward Jesse Compher to showcase her offensive capabilities. Beginning during the Terriers’ second game of the New Year, Compher earned at least one point in the next eight out of nine showings. On Bach’s first night back, the forward put up a goal 28 seconds into the first period against Providence College, setting BU up for a decisive 5-1 victory. The Terriers went on to pick up two more wins before the Beanpot tournament in back-to-back games against Merrimack College, which ended in an 11-2 goal difference in favor of BU. Sophomore defenseman Abby Cook put up a total of five points over the series. By end of the regular season, Cook led Hockey East defensemen in assists (16) while fellow redshirt sophomore defenseman Abbey Stanley came second in assists (15) among defenseman. Durocher had high praise for the core five defenders — Cook, Stanley, sophomore Breanna Scarpaci, and juniors Connor Galway and Reagan Rust — throughout the season. During the Beanpot, a 3-2 victory over Harvard University sent BU to its first Beanpot final since 2012. In the final against Boston College, the Terriers held a 3-2 lead until 4:08 remaining in the third period, when BC (30-3-3, 19-2-3 Hockey East) sent the game into overtime and eventually earned the Beanpot title with an overtime tally. After the Beanpot, BU ended the regular season on a high note by sweeping the University of New Hampshire, which included a shutout for senior goaltender Erin O’Neil during the second matchup. Once in the playoffs, a 4-1 win during the team’s second outing forced a game three, only to come short once more in a 4-3 overtime loss to Maine (19-13-5, 11-9-4 Hockey East). Despite a disappointing end to the season, the Terriers boast significant personal accomplishments. BU will be saying goodbye to six seniors this May. Senior forward Nina Rodgers earned 40 of her career 55 points in her two years as a Terrier, including 10 this season in 28 games. Senior defenseman Savannah Newton earned 20 points throughout her career, putting up three points, 30 shots on net and 36 blocked shots this season. Leslie, who served as captain in her senior year, broke the program’s all-time assist record, which was previously held by former Terrier and current Olympian Marie-Philip Poulin. Alongside 69 goals, her 171 points will leave her fourth in program history. She was also the first to record 20 goals and 30 assists in the same season, ending her final season with 24 goals and 33 assists. Her linemate and assistant captain Bach also had a career year that put her as a top-10 finalist for the Patty Kazmaier Award, which is awarded to the top NCAA women’s hockey player of the year. On Tuesday, she was also named the Hockey East Player of the Month for the third time this year. 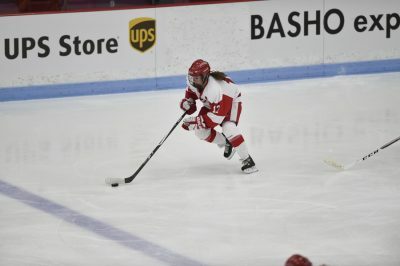 Bach ended her time at BU with a career total of 104 goals and 198 points, which lead program history, and 94 assists. In the 2017-18 season, her offensive play earned her 39 goals and 28 assists. Senior goaltender Ashlyn Aiello, the netminder who joined the varsity squad after leading the Terriers’ club to an Independent Women’s Club Hockey League championship, maintained a perfect 1.000 goal save percentage on five shots this season. O’Neil regained control in net for the final stretch of the season, including the team’s playoff run, where she made 36 saves in the series’ conclusion. She earned three career shutouts for BU, putting up a save percentage of .922 in her final season.